Have Dust Mask Will Travel! -- On August 24, Woodticks on 13 ATVs and side-by-sides rode parts of 4 trails (Moose River, Moose River Connector, Soo Line North and Hill City Connector). We were joined by Cass County Sheriff Tom Burch, and Sergeant Bryan Welk. We were prepared for the dust with bandanas and masks, and had a great time. We also got to see the new boardwalk trail and steel bridge on the Hill City trail, examples of how trails can be built to mitigate wetlands, and what we plan to build as part of our Grant-In-Aid trail in the future. More September Rides! -- Here is a chance to ride more new trails. As part of the ATVAM Fall Convention, there are two rides. Friday, September 20, is a guided VIP ride on the new Chisholm Trail, where you can ride with ATVAM board members, the MN DNR and state legislators. On Saturday, September 21st, there is a guided ride from Chisholm to Buhl through old mining areas. Saturday night is the ATVAM general membership meeting, and auction. See all the details and how to register for the rides at ATVAM.org. Woodticks Volunteer at State Fair -- Monday, August 26, was “Trails Day” at the DNR Building. Five Woodtick Wheelers (Dickerman, Bluth, Burress, Tuftin, Halsey) spent the day volunteering for the DNR to run the hydraulically operated ATV Simulator. We had 317 kids ride the simulator, giving us the opportunity to talk with them and their parents about ATV safety, regulations and state trails. Thanks volunteers! Grant-In-Aid Trail Moves To Step 2! -- On Tuesday, August 20th, the Cass County Commissioners voted to be the funding sponsor for our GIA Trail. The trail application has been revised following the county purchasing a strategic parcel of land to reroute the trail out of the Cty 5 ROW. It was signed by the county and is now with the MN DNR for its review. That moves us to Step 2 of the DNR’s 7-Step process to build a new OHV trail -- Party! -Youths who have completed all safety training are allowed to operate an ATV in the ditch while accompanied by a parent or legal guardian on another ATV. This helps families keep riding legally to towns and trails. -Class II ATVs (side-by-sides) can operate in the ditch for the purpose of accessing businesses or making trail connections. They can now also make left turns from any part of the road if it is safe under prevailing conditions. -ATVAM proposed and the legislature allowed there to be a “No Registration Weekend,” allowing ATV owners and nonresidents to use state trails without a registration sticker for one weekend each year. The goal is to get people unfamiliar with state trails to get out and discover them. This year, the Ride Free Weekend is August 31st and September 1st (Sat/Sun of Labor Day Weekend). 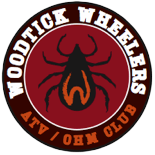 Thanks for renewing your membership and supporting the Woodtick Wheelers! We’re winding down the renewal dues activity for the year, and encourage everyone who hasn’t sent in their business ($25), family ($20) or individual ($10) annual dues to mail them to the club at P.O. Box 83, Hackensack, MN 56452. Every member counts! Thanks to all our business sponsors! We appreciate your support and encourage our members to support your businesses. See the Woodtick Wheelers web site for the complete list of 28 Business Members. Email us your comments and ideas for the club...and ride safe!